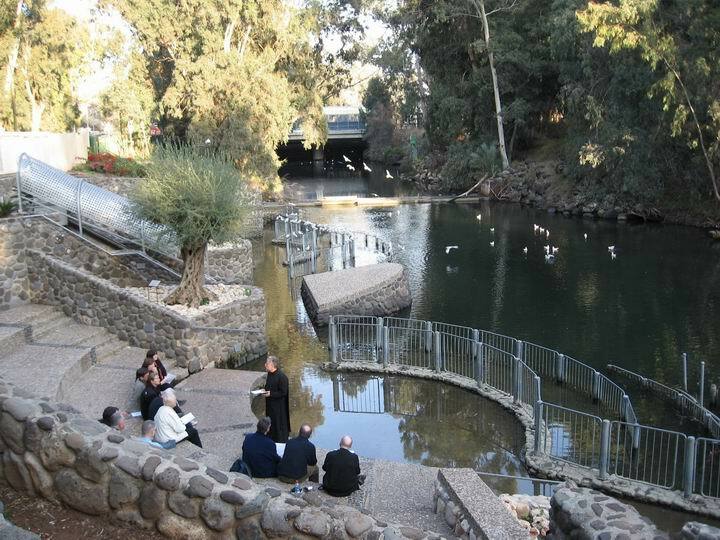 Yardenit baptismal is a popular site in the south end of the Sea of Galilee. At this site, or to the south of this site, was the place where Jesus was baptized by John the baptist, an important event in the life of Jesus. Matthew 3 13: "Then Jesus came from Galilee to the Jordan to be baptized by John. Yardenit ("little Jordan") is a popular Baptism site. Here, the water flows into the Jordan river, eventually flowing into the Dead Sea located more than 100KM to the south. This site is believed by some traditions to be the actual site where Jesus was baptized by John the Baptist (Matthew 3: 13 : "Then Jesus came from Galilee to the Jordan to be baptized by John"). Many Christian pilgrims stop at this site and perform baptism ceremonies, normally in small groups and accompanied by the group's pastor. It is a remarkable and charming site - and should not be missed. 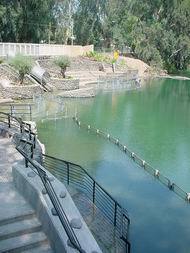 The site is located at the southern exit of the Sea of Galilee, just behind the gate of the Dam that is used on rainy winters to lower the level of the lake. The baptism site has a large parking lot, convenient dressing rooms, stairway to walk down into the waters, a restaurant and a shop. 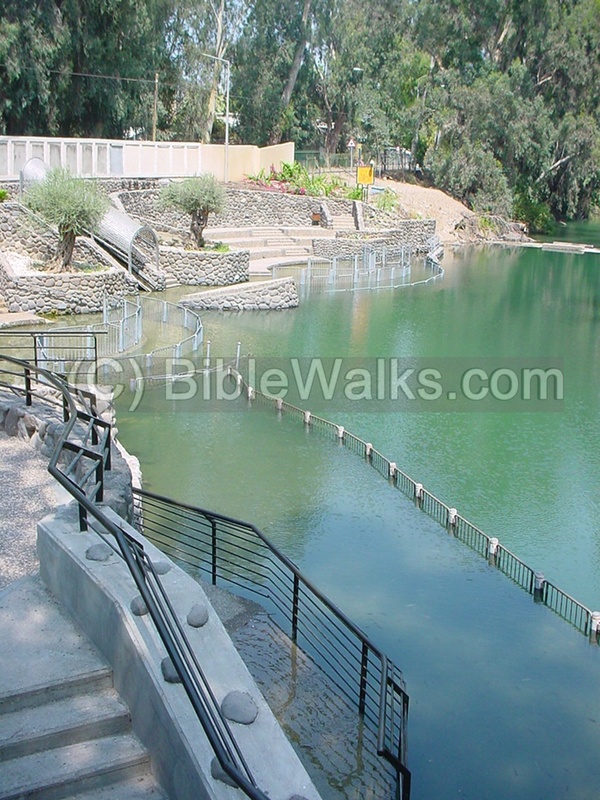 The site where the baptism takes place is seen in the following photo, looking towards the north (the sea of Galilee). In the following photo the group's pastor reads about baptism, and later sprinkles water with a branch on each member. Other visitors dress in white robes and dip in the Jordan river. A gathering of several hundred pilgrims in the site. There are about 400,000 visitors to the site each year, and is opened to all faiths and sects. The baptism of Jesus by John the Baptist is described in Matthew (3:13-17), told briefly in Mark (1:9-11), mentioned in Luke (3:21-22), and implied in John (1:29-34). In these texts John performs an important ritual : announcing that Jesus is the Son of God and the Messiah. "These things were done in Bethabara beyond Jordan, where John was baptizing. The next day John seeth Jesus coming unto him, and saith, Behold the Lamb of God, which taketh away the sin of the world. This is he of whom I said, After me cometh a man which is preferred before me: for he was before me. And I knew him not: but that he should be made manifest to Israel, therefore am I come baptizing with water. And John bare record, saying, I saw the Spirit descending from heaven like a dove, and it abode upon him. And I knew him not: but he that sent me to baptize with water, the same said unto me, Upon whom thou shalt see the Spirit descending, and remaining on him, the same is he which baptizeth with the Holy Ghost. And I saw, and bare record that this is the Son of God.."
" Then Jesus came from Galilee to the Jordan to be baptized by John. But John tried to deter him, saying, "I need to be baptized by you, and do you come to me?" Jesus replied, "Let it be so now; it is proper for us to do this to fulfill all righteousness." Then John consented. As soon as Jesus was baptized, he went up out of the water. At that moment heaven was opened, and he saw the Spirit of God descending like a dove and lighting on him. And a voice from heaven said, "This is my Son, whom I love; with him I am well pleased." "
"At that time Jesus came from Nazareth in Galilee and was baptized by John in the Jordan. As Jesus was coming up out of the water, he saw heaven being torn open and the Spirit descending on him like a dove. And a voice came from heaven: "You are my Son, whom I love; with you I am well pleased." "When all the people were being baptized, Jesus was baptized too. And as he was praying, heaven was opened and the Holy Spirit descended on him in bodily form like a dove. And a voice came from heaven: "You are my Son, whom I love; with you I am well pleased." Since the New Testament texts do not provide an identification with a known landmark, there are several traditions on the site along the long Jordan river. Some point to the Yardenit area closer to the sea of Galilee, some go south to Beit Shean, others to the section near Jericho near the Dead sea. According to these texts, the baptism site is probably close to the sea of Galilee, since all the biblical texts do not describe a long journey from the Galilee to the place of baptism. Thus, Yardenit, or its vicinity, is a logical choice. According to KJV version of John, the place was called "Bethabara". In Hebrew this may mean "the house of the crossing" of the river of Jordan. There were many crossings along the river, and a probable place will be closer to the Sea of Galilee. "And Gideon sent messengers throughout all the hill-country of Ephraim, saying: 'Come down against Midian, and take before them the waters, as far as Beth-barah, and also the Jordan. 'So all the men of Ephraim were gathered together, and took the waters as far as Beth-barah, and also the Jordan." Where is this place? An Arabic site of crossing of the Jordan may have preserved the name - Makhadet Abara (crossing of Abara), one mile north of the valley of Harod near Beit Shean, which is 20 KM south of Yardenit. 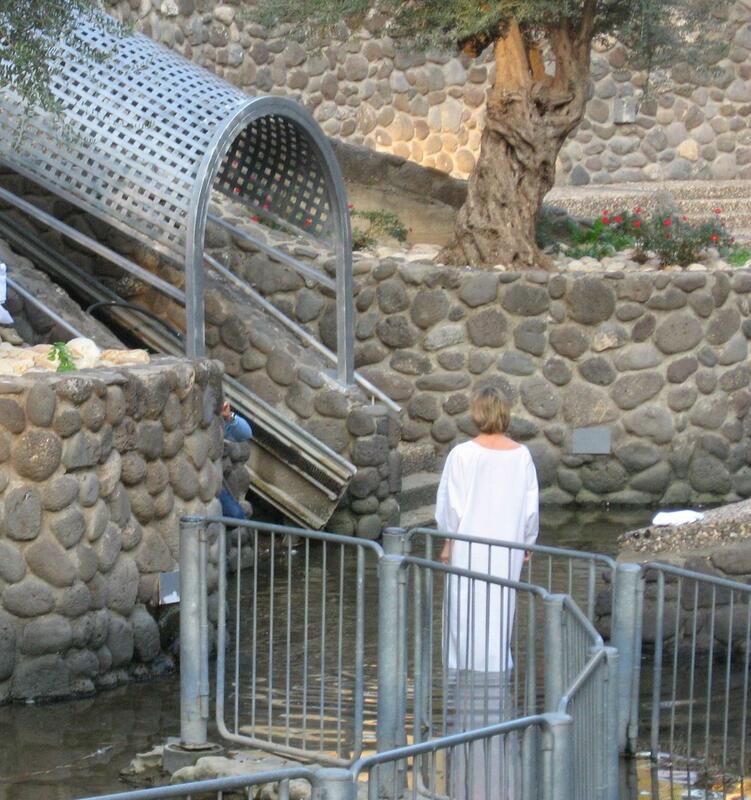 Another traditional site is on the Jordan river near Jericho. According to other versions of John, the place is near Bethany. This village's exact location is not clear. Baptism comes from Greek "Baptizo", which means to “immerse". Baptism is based on old testament laws of ceremonial washings, and is a custom also in current Jewish religion. "Yardenit" is sort of a "little Yarden", where "Yarden" is the Hebrew word of Jordan. Footsteps of Jesus - "100 events in the last 1000 days" - This pictorial presentation is arranged by BibleWalks staff. The baptism by John is event #2.